We educate. We credential. We lead. 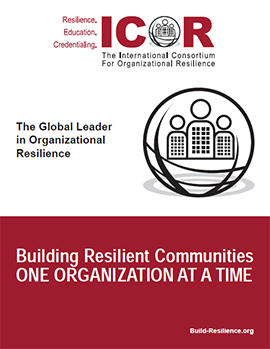 We participate globally in learning how individuals, organizations, and communities can become more resilient. To empower individuals with knowledge necessary to increase the resilience of the organizations they work for and within the communities they reside. To build more resilient communities one organization at a time. To be the source for education and credentialing in the disciplines that support building a more resilient organization. To provide a forum in which professionals can interact and contribute to the resilience of their organizations as well as to the communities where they live & work.